Since girls soccer was established at Palisades High School, the team has been a perennial champion in the Western League (Westchester, Venice, Hamilton, University, LACES and Fairfax), and almost always reaches the City Section playoffs. Last year, the Dolphins were seeded fourth in Division 1 with a 12-2-2 record, but were upset in the quarterfinals by San Pedro, 1-0. This year, teams such as University have adapted a new strategy to try and beat Palisades during league play. Goalie Katie Wilkes made a save. Chambers expects to see more of the same style of play when league play resumes on January11 at home against LACES. The Dolphins started the season by defeating Brentwood, 1-0, as sophomore Daniela Flores scored the only goal and senior Katie Wilkes played well in goal. 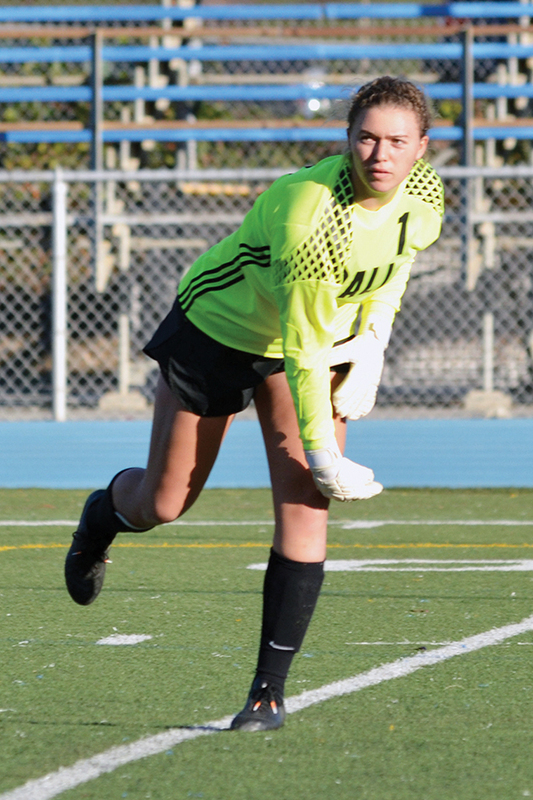 They then opened league play by blanking Hamilton, 2-0, with Flores and freshman midfielder Sadie Holt scoring. They also beat Westchester, 6-0. With their fierce defense, the Dolphins have not allowed a goal. “This is good group of ‘passing’ girls,” Chambers said. “We play well and move the ball well.” His team is young, with only seven seniors on the 24-player roster. The two goalkeepers, Wilkes and Kat Nuckols, are both seniors, and two starters—midfielders Zoe Capanna and Bella Esconbedo— are also seniors. Wilkes has committed to UC San Diego and Capanna has committed to Hartwick College in New York State. “Our team is coming together,” said Wilkes, who is also a captain. “We have one of the most talented teams PaliHi has ever had.” During the club season, Wilkes plays for Eagles ECNL (Elite Clubs National League) and had a shut-out game against the number one team in the Southwest Conference before going on break to play high school soccer. 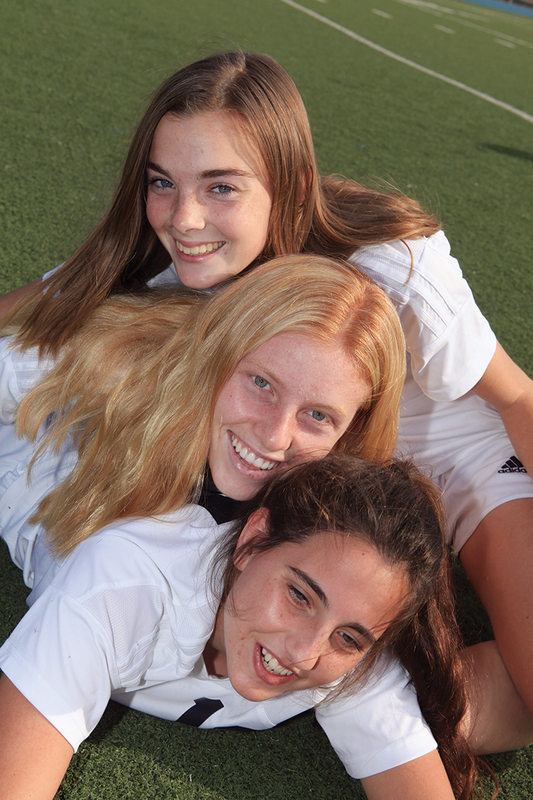 PaliHi soccer players (top) Meghan Jones, (middle) India Holland and Sammy Truman at the stadium before a team photo. Assistant coach Gary Truman said, “It’s a good little team in quality and numbers.” Chambers also praised the girls’ scholastic ability, noting that this team has one of the highest GPA’s of any soccer team in the state. He moved to the United States from Eng- land in 2002 after serving as a head coach in the Dorset Football Association; he received his first coaching certification from the English Football Association in 1995. In addition to his NFHS (National Federation of State High School Associations) coaching certificate, Chambers has his “E” and “B” coaching licenses, and works as a club soccer coach for Santa Monica United. He has a master’s degree in physical education and sports education from the University of Bedfordshire. Pali’s varsity and JV teams will play El Camino Real on January 3. The Dolphins will then host Cleveland on Jan. 5 and Santa Monica High on Jan. 9, both at 2:30 p.m. at home.